Are you feeling rejected, your emotions going off the charts, assuming, and maybe even panicked over some situation in your life? Does your heart feel broken? Or, do you know someone who has a broken heart? When we put our problems in God’s hands, He put His peace in our hearts. God has made a way to heal every place that hurts. He has made a way to heal your wounds of rejection and bring you into acceptance with Him. The steps to being healed from rejection are simple, but not always easy in life. You can succeed as you partner with the Holy Spirit of God. The Bible says: He Himself has said, “I will never leave you nor forsake you” (Hebrews 13:5 NKJV). Many have walked in and out of toxic and abusive relationships….from marriage to even business. Almost every person has experienced some form of rejection at one time or another. Your date didn’t show up, you were snubbed by a friend, you didn’t make it on the team or the school play, you were not accepted at the college of your choice, you didn’t get the position you thought you should have gotten, to a spouse walking out for another person and the pain of divorce. Rejection can be simply put as the sense of being unwanted and unloved. Rejection can leave a person feeling empty….and trying to fill a void that only God can fill. Closely related to rejection are the wounds of shame and betrayal. A leader or friend gossips and shares a confidence saying it’s called prayer to trying to harm you on purpose. Society is suffering from a progressive breakdown of interpersonal relationships, lack of respect and showing honor. Because God wants to use you as a world changer, the devil tries to emotionally cripple every person at a young age so they do not step into their God-given destiny. Rejection can be paralyzing if we don’t have spiritual eyesight. When our focus is on the world and not on God, we start to live in darkness. Satan will set you up to be upset…and use the very people you least expect. Satan is afraid of what you can become in Jesus Christ. So listen up…the people who have walked through hell on earth and been the lowest often end up the highest in God. The Scriptures tell us, “He who humbles himself will be exalted” (Luke 18:14). God wants to use you to advance His Kingdom. Run to God and receive healing…and reach out a helping hand to others who are walking in pain. Both our ability and inclination to love God and other people spring from the grasp and understanding of His great love for us. Ask God to give you a heart like His….to see what He sees, feel what He feels….and a desire to be an extension of His heart to all you meet. God equips us and empowers us to comfort those where we have been comforted. If you truly knew the gift of God—His great love for you—you would be enthralled by Him. “But when He saw the multitudes, He was moved with compassion for them…” (Matthew 9:36a NKJV). The Greek word translated “compassion” implies a forceful, physical reaction in a person’s body in the abdominal area. It is a reaction so strong that it demands a response. A person who is moved by compassion has to do something. A person who is “moved with compassion” cannot sit on the sidelines and only observe. They are constrained by the love of God and moved by compassion to do something. Why was Jesus so moved? “….because they were weary and scattered, like sheep having no shepherd” (Matthew 9:36b NKJV). If this is how you feel…..stressed, angry, fearful, anxious, burdened down, weary, harried, confused, and perplexed….Jesus sees you….just as He saw the multitudes. Jesus has compassion for you and He is longing to heal every place that hurts. One of the most common roots of all personal problems is rejection. A marriage fails and one or both spouses experience rejection. Children are left feeling the wounds of abandonment. I remember clearly walking with my daddy and can still feel my hand in his as we walked when I was a child up the mountain. Just a few years ago, I remember laying my head on his chest on a few occasions as we stayed with him for the last 17 days of his precious life…with his hand on mine and my sister’s heads. We just wanted to cherish every minute with our father. We were surrounded by family, friends, and people that God used to encourage us. Our wonderful God-fearing mother never left our father’s side…she is a gift from God. Family is a gift from God! Cherish the people in your life. There is no greater feeling of security than that of a father…being in his arms…and climbing up in his lap with your head resting on his strong chest….it feels secure. God designed every person to crave this kind of security. A child can never truly be fulfilled, satisfied, or secure without parental love—especially love from a father. God is our perfect Heavenly Father…. The picture of broken families and rejection is rampant. Children grow up to be adult children with wounds of rejection. Sometimes there is the added pain of betrayed trust…and always great heartache. “See, I will send you the prophet Elijah before that great and dreadful day of the LORD comes. He will turn the hearts of the fathers to their children, and the hearts of the children to their fathers; or else I will come and strike the land with a curse” (Malachi 4:5-6). For those who will turn to God through Jesus, there is healing. “He has made us accepted in the Beloved” (Ephesians 1:6 NKJV)—Jesus. GOD’S PRICELESS TREASURE (How To Overcome Challenges, Be Transformed, and Know Your Purpose)….learn how to move from drama to destiny, pain to purpose, a mess to a message, and triumph through turning to Jesus Christ. A LEAP OF FAITH (25 Days At The Mercy Seat)….the intertwining ways and divine connections made by the Holy Spirit of God, how He reveals all hidden truth, how God still raises the dead, still heals, and how He leads will keep you turning the pages…and give you new hope to believe God for anything. Don’t miss the confession prayer within the pages…and pray it daily over yourself, family and friends. WHAT WILL IT TAKE FOR YOU? If you were outside your home and saw your child walking too close to the road, you would run after your child and get their attention with spoken words, right? No good parent wants their child’s life cut short. You would yell “No,” rather quickly and not think twice about it…for sure. You will take a stand if you are going to lose everything. You will take a stand when you align yourself with God and see people walking down a wrong path. If you were clipping limbs off a tree and a copperhead snake slivered out, would you pet it and invite it in for dinner or cut the head off? You either have to stand up to evil or be bitten. Satan is mad and there is a real war raging over the future of America and the nations, over the culture, over destiny and the prophetic. Satan knows his time is short. Laws have been changed to go against God’s Word, bills that appear good for the people but bring about destruction and ruin are in place, and like the leadership had to be changed in the time of Daniel, we need a change in some areas as well. (See Daniel chapter 1). Daniel and his friends faced the opportunity to please God or please mankind. For Daniel, he chose to obey God. Satan knows how to cleverly disguise something to appear good, to save us money or make it appear that way, but in the end to bring about destruction. Any time a person is moved by padding their own pockets, and do not care about the good of the people, it is an evil plot. Esther encountered such a time as this recorded in the Bible. God saved the Jewish people because Esther chose to stand up and take a risk. In our culture and media, God’s name is mentioned with little reverence. Only in the midst of tragedy did the nation turn to God on September 11, 2001 for about three weeks. Satan has infiltrated the minds of people to even state that people who hear God have some type of mental illness. Instead of allowing the enemy to devour and destroy us, it’s time for pest control. Get rid of fear, doubt, and unbelief. Run the enemy out of your mind and heart. Take a stand and speak truth in love. If at any time any of us get more concerned about money than we are souls, we are in trouble. If a pastor won’t speak truth to a person because he or she is one of their biggest givers in the church, or speak to friends and family who go against God’s Word, it is no different than big government that is more concerned with profit than the people they are called to serve. Fear can prevent any of us from taking a risk and taking a stand. It’s time for all people to know that we can live and have abundant life in Christ—but the world system and God’s ways are not the same. God’s ways are always best. Our view of Him impacts three areas of our lives. First, our prayers. When we recognize His greatness and power, we will become more confident that He can accomplish mighty things—(Ephesians 3:20; James 4:2). Second, our understanding of God’s righteousness and His goodness influences our behavior. As we desire to be more Christlike, if we want to be blessed by Him, then it is in our best interest to quickly obey Him and His Word. As we desire to be like Him, to desire righteousness, we will be quick to repent of sin instead of blaming people, manipulating, and acting out in the flesh. Third, our faith is highly impacted. Knowing that God can be trusted, that we know He is good and wants the best for us, causes us to fully trust Him. Knowing God and remembering His awesome acts on behalf of all mankind and those in our personal lives will build our confidence in Him. The Bible says, “My sheep hear my voice, and I know them, and they follow me: And I give unto them eternal life; and they shall never perish, neither shall any man pluck them out of my hand” (John 10:27-28). Who on earth would not want eternal life in Christ? God’s name was not mentioned in the entire book of Esther but His Hand was evident throughout. God is awesome. He is forever to be praised. He saves His people. Purim is a Jewish holiday that commemorates the saving of the Jewish people from Haman, who was planning to kill all the Jews. Purim, or the Feast of Lots, is a joyous holiday that recounts the saving of the Jews from a threatened massacre during the Persian period. Esther, who chose to take a stand shows the leading role she played in saving her people. She chose. She took a risk. Look at her background for a moment. “Mordecai had a cousin named Hadassah, whom he had brought up because she had neither father nor mother. This young woman, who was also known as Esther, had a lovely figure and was beautiful. Mordecai had taken her as his own daughter when her father and mother died” (Esther 2:7). Take time to read the Book of Esther. Ask the Lord to open your eyes to come under His Mighty Hand—the Holy Spirit, Prayer, the Word of God, the five-fold ministry, and the brethren. Don’t allow the enemy of your soul to isolate you from those you love. Satan is evil and always scheming to take God’s people out. Our rights come from God, not from government. Every living human being has a soul. God has a plan and a purpose for every person…it’s up to us as individuals to make the choice to obey God or not, to receive the gift of eternal life or not. Will you choose? What will it take for you? Stand strong, take a stand, step out and take a risk with God. When we wholeheartedly align ourselves with God…we stand with Him. We cooperate with His plan and purposes in the earth. Since God is for us, nothing can be against us. I have read the end of the Bible—and it ends well. How will your story end? God is raising up precious men and women of God who will take a stand with Him, and spread the message of hope in God—the Blessed Hope—Jesus Christ! The Promises of God are “yes” and “amen.” God’s best is stored up for you. Yes, you will have to overcome obstacles and opposition in order to lay hold on all God has for you. Meditate upon God’s Word. Pray the Word and obey God’s instructions. Get His Word on the inside and then share it with the world about you. The Word of God will sustain you through the fire, through the storms, and while you are fighting the good fight of faith required to lay hold of all God has promised. Share the Word…tell your children and grandchildren. Tell your family, friends, and those who come against you. Tell the world about Jesus! God may have called you to take a stand in the realm of government, He may have called you to do full-time ministry, or start your own business. God may have you homeschooling your kids, raising your family to know God or you may be a full-time parent and work a full-time job as well. God’s plan and purpose for you is good…the most important thing you will ever do is fully and wholeheartedly receive and align yourself with God through Jesus Christ! The second most important thing is living that life out before the world around you…will you take a stand for Christ? Books by Dr. Deborah Starczewski…available at Amazon, Barnes & Noble, www.starministriesinc.com and other distributors. GOD’S PRICELESS TREASURE (How To Overcome Challenges, Be Transformed, And Know Your Purpose)….learn how to move from drama to destiny, a mess to a message, pain to purpose, and trials to triumph through turning to Jesus Christ. A LEAP OF FAITH (25 Days At The Mercy Seat)….read the amazing accounts of how God intervened, raised my husband from death, healed him from two strokes, and walked with us through two open-heart surgeries at Mercy. The natural manifestations and extreme details revealed will give you hope to believe God for yourself, for your family, and the nations. THE MIDNIGHT HOUR (Will America Turn Back To God? )….we are living in the Last Days…before the return of Jesus Christ….make sure of your relationship with Jesus and lead your family and friends to Him. You are a world-changer! Having money and the love of money are not the same things. The love of money is an issue of the heart. Money is a tool for exchange. It is used to grow business, to move things, to change things, to grow relationships through investing. We use things….we love people. We don’t love things. We value life and people. If at any time you move from loving people to seeing them as only tools–assets or liabilities–there is an issue with the heart. Money can be used to build homes for the needy, to send the Gospel across the nations, and to assist in times of crisis. Once a person begins to serve money, they will do anything to get more of it. It can cause a person to become more self-sufficient than God-conscious. It can cause a person to betray their own family and associates–just like Judas. Be on guard about your need of Jesus as LORD and Savior. 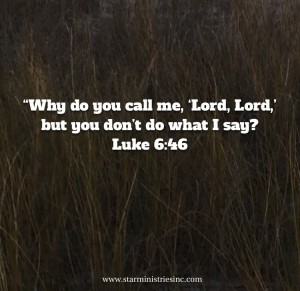 The Bible says, “Why do you call me, ‘Lord, Lord,’ but you don’t do what I say” (Luke 6:46). If we love God, we will obey His Word. A LEAP OF FAITH (25 Days At The Mercy Seat)….the full account of how God raised my husband from death, healed him from two open-heart surgeries and two strokes, and how the story of my father’s passing and my son’s surgery in 2005 intertwined in 2012. Learn that we live under an OPEN HEAVEN because of the finished work of Jesus Christ. This book will give you hope to believe God for anything and has prayers and confessions you can pray over yourself and others as well. THE MIDNIGHT HOUR (Will America Turn Back To God?) ….a must read for all. All available on Amazon, Barnes & Noble, www.starministriesinc.com and other distributors.